A complete UHF lavalier system consisting of the 411DRH 63-channel receiver and the 51BT bodypack transmitter. 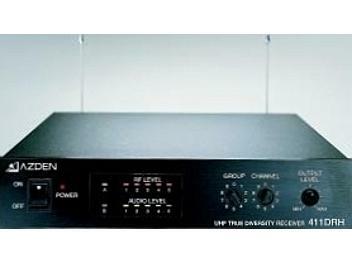 The Azden 411 series provides affordable UHF wireless microphone systems ideal for small theater, clubs, restaurants, lectures etc. The 51BT body-pack transmitter has 63 user selectable UHF frequencies and is ideal for lavaliere and headset microphones. The 411DRH is crystal controlled, PLL synthesized receiver with 63 on-board user selectable frequencies with a range of 794MHz to approx. 806MHz. It is true diversity, containing two separate receivers, each operating on the same frequency. The transmitter's output signal is monitored constantly by a diversity circuit, which switches automatically to the receiver with the stronger RF signal. This allows wireless performance that is virtually drop-out free, even under the most adverse conditions. The receiver features a 1/4-inch and XLR output jacks and volume adjustment. Pre-emphasis : 50 Micro Sec. Audio Output Impedance : 2.2 k ohms unbal., 660 ohms bal.